Murray Martin should change his name to Dr. Doom. Now in retirement, the former CEO of Hamilton Health Sciences is full of swagger about tough choices for health care, suggesting rising interest rates would pressure the government into making big cuts if they don’t make significant adjustments now. Never mind that the Bank of Canada’s benchmark interest rate of 1 per cent has not budged since 2010. Changing interest rates also take considerable time to work through the system before they impact the rate the government pays on its bond debt. It’s not like the sky is about to fall. Whatever happened to evidence-based decision-making? Martin wildly believes the province should force more hospital mergers to find savings — this just days after the Scarborough-Rouge Valley hospital merger came to a screeching halt over the high cost of such a merger. Last week’s provincial budget was accompanied by an uncharacteristic snippy release from the Ontario Hospital Association expressing disappointment. While OHA CEO Pat Campbell says there are a few positive initiatives for hospitals and the health care system, the chief complaint is over the lack of a comprehensive capacity plan. That’s likely a fancy way of saying the government is cutting the heck out of us, putting some of that money elsewhere, and hoping it all balances out okay. If we are looking for any more sophistication than that from government, we’re likely to be disappointed. Health Minister Deb Matthews has repeatedly said that downsizing hospitals in favor of more community based care is the plan. In the budget they go as far as listing endoscopies, dialysis and vision care as the next wave of services to be divested to not-for-profit clinics, even if no evidence is presented on costs. Pat Campbell has been named the new president and CEO of the Ontario Hospital Association. Campbell most recently served as CEO of Echo, an agency whose goal is to collaborate with health partners and conduct research to improve women’s health. 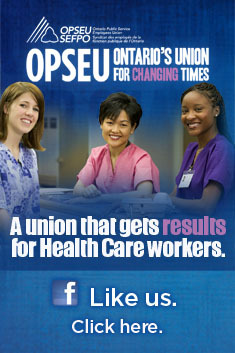 She may be more familiar to OPSEU members as the past President and CEO of Grey Bruce Health Services. Campbell will take up her role June 4 and replace interim OHA President Mark Rochon.